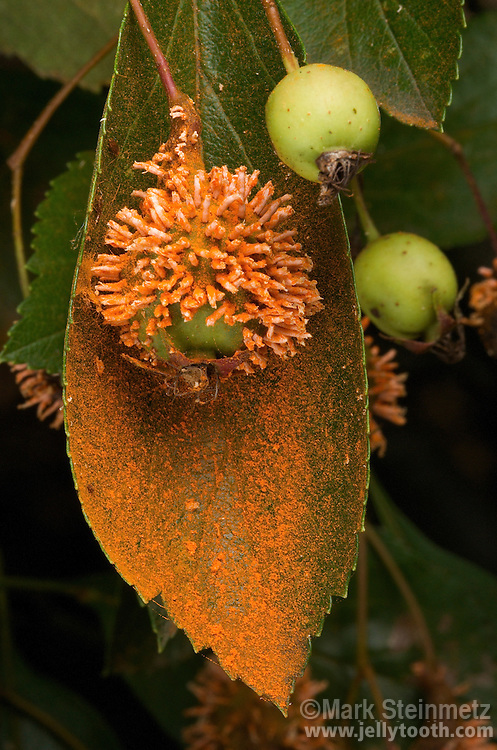 Cedar-Quince Rust (Gymnosporangium calivpes). In this phase of its life cycle, horn-like structures are maturing on the fruit of a Hawthorn (Crataegus) tree, dropping a bright-orange mass of spores, or aeciospores. This is a problematic plant pathogen that parasitizes a variety of trees, and involves a complex life cycle between junipers (most often Eastern Red Cedars), and plants in the Rose family (most often hawthorn, crabapple, and quince trees). The alternating host plants are necessary for survival of this fungus. Dawes Arboretum, Newark, Ohio, USA.